Groups 12+ SAVE up to $20 off the Ticket Price! Group 12+ SAVE up to $20 off the ticket price! RESERVE NOW to SECURE the best seats at the best prices before tickets go on sale to the public May 10! 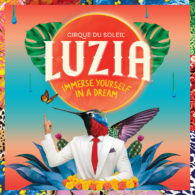 Freely inspired by Mexico, LUZIA is a poetic and acrobatic ode to the rich, vibrant culture of a country whose wealth stems from an extraordinary mix of influences and creative collisions – a land that inspires awe with its breathtaking landscapes and architectural wonders, buoyed by the indomitable spirit of its people.